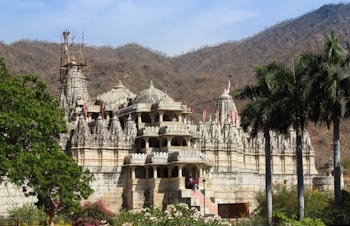 Nestled in the valley of the tranquil rural Aravalli range approximately 90 km from Udaipur are a series of Jain temples in Ranakpur. 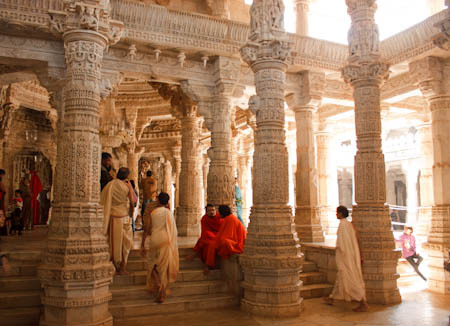 The site is a place of pilgrimage for Jain devotees from all over the world and tourists who marvel at the marble masterpieces. 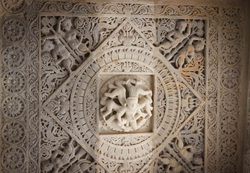 The largest and most important temple within the complex is the Chamukha Temple, dedicated to the first Jain Tirthankara, Adinath. 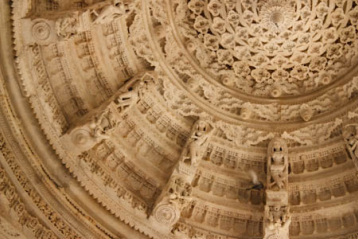 This 15th century temple is both massive and complex: the basement level being 48,000 sq. 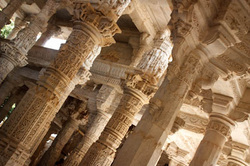 feet, four separate entrances, four subsidiary shrines (each with individual roofs), 24 pillared halls, 80 domes, and 400 columns. 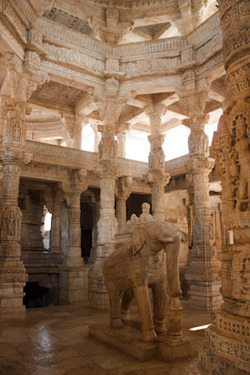 The entire complex boasts 1,444 columns, each ornately carved with no two alike. Throughout the day, the columns’ colors vary with the change of light, ranging from golden all the way to pale blue. 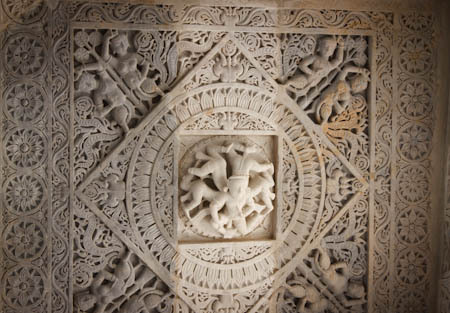 Except for the smooth marble floor, all other surfaces including the domed ceilings seem to be encrusted with a profusion of details, ranging from designs, posing figures, mythical creatures, to featured animals such as elephants. 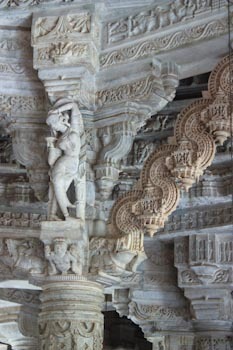 With such attention to detail, it is no wonder that the temple took 65 years to complete.